“There is only one Provence in the world,” Fabienne declared. A neighbor of my host, she had invited me for coffee and a view from her terrace one afternoon and we had hit it off immediately. Born of a Swiss mother and Haitian diplomat father, she was tall, slender and beautiful, with finely chiseled features and a long, gray mane that contrasted with her mahogany skin. Fabienne held herself like a dancer or a queen, with the body of an athlete and the ferocious passion of an Amazon. Vivacious, charismatic and much given to bold declarations, she was one of those people who is good at everything she does, took care to do it to perfection, and then considered it her solemn duty to teach you how to do it. 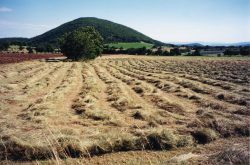 As for her declaration about Provence, I knew what Fabienne was referring to: not the uniqueness of the landscape, but the singular congruity of its inhabitants with it. There, life seemed to go on as it had all along, not just over decades, but over centuries. The immemorial heart of the village beat unchanged — as always, farmer, artisan, shopkeeper, and neighbor traced their intersecting trajectories within the visible circumference of their world, ringed by the sheltering hills. The global winds of anarchy did not seem to blow here, only the famed mistral. Over the days following my arrival and then the ensuing months, the region’s dreamlike terrain came to inhabit me, shaping the interior landscape of my heart to its contours. It was a living canvas painted with iconic images: villages clinging like doves to the steeples of their hills; sheep and shepherd stitching their way across the lavender-striped quilt of the land; the beehive-shaped bories of gray stone on the rocky slopes that looked to have been placed there by a race far more ancient than the Celts or Romans, much less a nineteenth-century shepherd. Haute Provence was like a fantasy: a hallucinatory, arid Eden. It was therapy to my soul. My habitual internal narratives about past and future (regrets, hopes, fears) had been intensified by 9/11 and its aftermath — burning buildings and falling people, followed by falling bombs and burning people. But Provence brooked no such distraction. Like a meditation, it summoned me into the moment. The limestone hills and azure sky commanded my gaze. Brilliant blue butterflies sketched patterns on the air. Wildflowers splashed their pointillistic colors against the tawny fields. The clang of sheep bells, a songbird’s arpeggio, or the persistent hooting of the cuckoo from sunup to sundown sounded periodic calls to attention that jolted me out of my self-hypnosis. Traveling always shakes you out of your accustomed assumptions about reality; dropping you into alternate realities, it demands fresh thinking. In the wake of 9/11, my sojourn in Provence shook me out of something more: the dystopic spell of the war on terror that mesmerized many Americans into hatred and suspicion against enemies both real and imagined. It wouldn’t be long before France would fall victim to America’s penchant for jingoism during the run-up to the war in Iraq. Some Americans would make spectacles of themselves by renaming French fries “freedom fries” and boycotting French wines. But even those who considered themselves enlightened liberals above such silliness fell prey to a kind of lockstep militarism — like Michael Ignatief, who gave full-throated support to the U.S. attack on Iraq in 2003, only to publicly recant in 2007. Even before fear fanned the flames of hatred, Americans have long been ambivalent about France. Without much evidence either way, I came to Provence with some of the common American prejudices against the French: they’re arrogant, unfriendly, and snub you if you aren’t fluent in their language. But I found to my surprise that I was drawn quickly into an embracing circle of new friends. Their hospitality was unstinting. They took great pleasure in sharing the abundant gifts of their land — black, fragrant truffles, soft disks of goat cheese wrapped in native chestnut leaves, wine tapped from great, gleaming barrels down at the local winery into bottles brought from home, the view from a terrace, or a hike in the hills — all leavened with the yeast of good conversation. Jeremy Rivkin has said that for Europeans, belonging is more important than belongings. I think this is true, and even more true for the denizens of Haute Provence. This embrace into a circle of belonging, not just to people but to people and place together, was something quite novel to me. I was accustomed to the diffident manner of my New England compatriots who erected subtle barriers to new acquaintances much like the stone walls that seam their forests: hidden but enduring. But these French southerners seemed to have few boundaries to throw up in the way of welcome. It took some getting used to. My new friends stood very close when they talked to me; they revealed the most intimate details of their lives, sometimes within moments of introduction. They also felt free to criticize my dress, comportment, language, opinions, and anything else that they felt needed improvement — strictly for my benefit, of course. They criticized what they saw as America’s “Cowboy” mentality, but they welcomed this American with open arms and even genuine love. Raw and bruised after 9/11, beset with the fearful realization that the world crisis made me and all I loved personally vulnerable (a new notion for a privileged American), I found a measure of restoration in this remote and beautiful region, where the connections between people and between people and their environment are always vivid and palpable. The world began making sense again. No one embodied this spirit of connection more than one Monsieur Keyvan, the Cure Hunter. A week after my arrival, I took my host’s Audi to Folcalquier, a small city in the region that holds a large market every Monday. Folcalquier is a metropolis compared to the tiny villages that surround it and its market is a cornucopia of delights. A panoply of different cheeses, olives, and tapenades of diverse provenance; essential oils and scented soaps; fish, meats, vegetables, and breads of all kinds (including those of the ancient grain, épeautre, traditional to Provence); quiches, paellas, roasted chickens, and pizzas; heaps of sweet biscuits called navettes; jumbles of leather handled straw market bags in a rainbow of colors and patterns; clothing stalls with styles from chic to cheap; kitschy paintings of Provence; bouquets and bunches of fresh and dried flowers; olive oils hailing from every little slope and artisanal mill; delicately patterned drums and digeridoos from faraway lands; and handicrafts, textiles, and pottery printed with the distinctive yellow and blue floral patterns of the region: all these and more were among its treasures. Under broad canvas tents, merchants waited on browsers and buyers like hospitable sheiks. I wandered, overwhelmed, past all the bounty, jostling shoulders with the polyglot crush of residents and tourists that crowded the narrow streets. Rounding a corner with a fishmonger’s booth, I was startled by a giant swordfish head that breached the crushed ice, its weapon thrust upward in a last, futile gesture of defense. Next to it, a grotesque rascasse (much loved by bouillabaisse cooks) grimaced open-mouthed, baring its terrible teeth. I squeezed down the narrow street, past a booth of exotic herbs and spices from all over the Mediterranean that filled neatly arrayed cloth sacks to the brim with their colors— black, white, pale green, deep vermilion, ochre, beige—like offerings to us, the customers, deities for a day. A young dairyman in a traditional black fedora cheerfully offered slices from an enormous round of cheese to passersby. Although many took, I didn’t see any buyers. But he seemed unperturbed. After an exploratory nibble, I moved on. I was looking for an herbal tea that could cure my troubled sleep. During the day, the charms of my new surroundings distracted me, but at night I wrestled with horror about what I had left behind in New York and anxiety about the future. I tossed and turned on my narrow bed, rocked by a stormy sea of dread. Provence is a botanical garden of medicinal herbs, of which lavender is the best known. The dry Mediterranean climate forces plants to conserve moisture with tough, oily leaves. Strolling among the booths, I chanced upon just the thing, a table laid out with an array of cellophane packages of dried herbs neatly stacked in rows. “M. Katouzian Keyvan. Ramasseur des Simples,” said the sign on the vendor’s van. I browsed silently for several minutes, searching for something familiar among the offerings. But the French names confused me, and I hovered in indecision. A short, stocky man with a rumpled look moved around the interior of the van. I was the only customer, and he peered out at me finally with an air of friendly invitation. “Is there something I can help you with?” he asked. Perhaps in deference to my foreignness, his French was slow and distinct. I told him my problem, and he pointed to a bag containing elongated leaves and wisps of small flowers. “Many people use tilleul to help them sleep,” he offered as he handed it to me. “Tilleul” is the linden tree, and steeping the leaves creates a tisane with a floral, slightly sweet taste. “Are they grown bio?” I asked, using the European term for “organic”. “Ah!” he exclaimed with delight, as if this were the very question he had been waiting for. “See?” And he pointed to his sign. “Ramasseur des Simples. That means I gather all the herbs from the wild — and I am the only one in the whole region to do so,” he proclaimed with pride. “All the other herbs sold here are grown by farmers, often with chemicals.” He wrinkled his nose in disapproval. “L’Ail des Ours,” the label showed. “Bear’s Garlic,” I translated silently. I shook my head no. “It must cost quite a lot in fuel and labor if you are traveling so far. How do you make any money?” I queried him. He looked at me for a moment as a slow smile lit his grizzled face. “I don’t make very much. But I don’t need much either. What do I need a lot of money for? I have a home, enough food to eat. If I charged according to the labor, nobody would buy my herbs.” His prices were indeed reasonable, less than three dollars for a good-sized bag. “Not at all. One year the plant is here, another year it is somewhere else. Some years there are many; others none at all. Nature is like that.” And he grinned broadly, evidently undisturbed by the vagaries of supply. Monsieur Keyvan is a happy man. He loves his work; his needs are few. And the sun-drenched hills of southern France are his workshop and study. That evening I steeped some dried leaves of tilleul and imbibed the steaming brew. Then I slept like a baby.